He was obviously concerned for my lack of plans because he literally dropped me off in front of a free-standing visitors booth just a block away from the main pedestrian street in Mendoza. He waved his hands encouraging me to visit the booth. I thanked him and got out of the taxi. He waited until I got myself situated – my big backpack on my back and my daypack firmly secured on my front. I asked the visitors booth for a map. I took it and then headed towards the pedestrian only street (Avenida Sarmiento) where there were tons of cafes. I decided to park myself at Havanna, South America’s omnipresent coffee shop (think Starbucks), hooked my backpack under the leg of my chair, ordered myself a submarino and got to work to find myself a place to stay. Let’s talk about this submarino for a second. It is hot (steamed?) 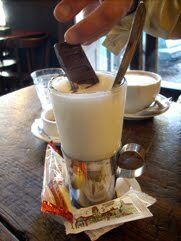 milk served in a tall glass with a chocolate bar served on the side. You put the bar in, mix it and drink it. Heavenly. Can you believe it? Not one photo — because I drank it before I could photograph it! Photo courtesy of NC. While I waited for my submarino, I pulled up the top Mendoza hostels on TripAdvisor and wrote down their addresses and phone numbers. I didn’t see the hostel from the Lonely Planet I had booked from the airport for the night before so I let it go. Learning from my earlier experience in Colonia, Uruguay, I did not put all of my eggs in one basket and instead made a shortlist of three hostels (TripAdvisor #1, #1 and #3). I marked each hostel on the map, mapped out my walk in case I needed to hit all three due to the lack of availability, shut my computer and took in the morning café life in Mendoza. This entry was posted on Saturday, December 7th, 2013 at 8:00 am	and tagged with argentina and posted in career break, hostels, last minute travel. You can follow any responses to this entry through the RSS 2.0 feed.